(-1) For effective micro- and macro- prudential financial supervision, a single European supervisory authority should be established, fully integrating the European Banking Authority (EBA), the European Insurance and Occupational Pensions Authority (EIOPA), the European Securities and Markets Authority (ESMA) and the European Systemic Risk Board (ESRB) into a single entity based on, and working closely together with, national supervisory authorities. A European Systemic Risk Board, hereinafter referred to as 'ESRB', is establisrticle 1 Article 1 Establishment The European Financial Supervisory Authority 1. The European Financial Supervisory Authority (EFSA) shall ensure that the rules applicable to the financial sector are adequately implemented, in order to preserve financial stability and thereby to ensure confidence in the financial system as a whole and sufficient protection for the customers of financial services. 2. The EFSA shall comprise the following: (a) the European Systemic Risk Board; (b) the European Supervisory Authority (Securities and Markets) established by Regulation (EU) No .../... [ESMA]; (c) the European Supervisory Authority (Insurance and Occupational Pensions) established by Regulation (EU) No …/…[EIOPA]; (d) the European Supervisory Authority (Banking)[EBA]; (e) the Commission, for the purposes of carrying out the tasks referred to in Articles 7 and 9. 3. The Authority shall cooperate regularly and closely with national supervisory authorities. It shall ensure cross-sectoral consistency of work and arrive at joint positions in the area of supervision of financial conglomerates and on other cross-sectoral issues. 4. In accordance with the principle of sincere cooperation in accordance with Article 4(3) of the EU Treaty, the parties of the EFSA shall cooperate with trust and full mutual respect, in particular in ensuring that appropriate and reliable information flows between thedm. (-1) For effective micro- and macro- prudential financial supervision a single European supervisory authority should be established, fully integrating the European Banking Authority (EBA), the European Insurance and Occupational Pensions Authority (EIOPA), the European Securities and Markets Authority (ESMA) and the European Systemic Risk Board (ESRB) into a single entity based on, and working closely together with, national supervisory authorities. Establishment and Scope of action 1. This Regulation establishes a European Banking Authority ("the Authority"). 2. The Authority shall act within the scope of Directive 2006/48/EC, Directive 2006/49/EC, Directive 2002/87/EC, Directive 2005/60/EC, Directive 2002/65/EC and Directive 94/19/EC, including all directives, regulations, and decisions based on these acts, and of any further Community act which confers tasks on the Authority. 3. The provisions of this Regulation are without prejudice to the powers of the Commission, in particular under Article 226 of the Treaty to ensure compliance with Community law. 4. The objective of the Authority shall be to contribute to: (i) improving the functioning of the internal market, including in particular a high, effective and consistent level of regulation and supervision, (ii) protecting depositors and investors, (iii) ensuring the integrity, efficiency and orderly functioning of financial markets, (iv) safeguarding the stability of the financial system, and (v) strengthening international supervisory coordination. For this purpose, the Authority shall contribute to ensuring the consistent, efficient and effective application of the Community law referred to in Article 1(2) above, fostering supervisory convergence and providing opinions to the European Parliament, the Council, and the Commission. 5. The Authority shall form part of a European System of Financial Supervisors, hereinafter referred to as 'ESFS', which shall function as a network of supervisors, as further specified in Article 39. 6. The European Banking Authority shall co-operate with the European Systemic Risk Board, hereinafter referred to as 'ESRB' as laid down in Article 21 of this RegulationArticle 1 Article 1 Establishment and Scope of action 1. The European Financial Supervisory Authority (EFSA) shall ensure that the rules applicable to the financial sector are adequately implemented, in order to preserve financial stability and thereby to ensure confidence in the financial system as a whole and sufficient protection for the customers of financial services. 2. The European Financial Supervisory Authority shall comprise the following: (a) the European Systemic Risk Board established by Regulation (EU) No .../... [ESRB]; (b) the European Supervisory Authority (Securities and Markets) established by Regulation (EU) No .../... [ESMA]; (c) the European Supervisory Authority (Insurance and Occupational Pensions) established by Regulation (EU) No …/…[EIOPA]; (d) the European Supervisory Authority (Banking)[EBA]; (e) the Commission, for the purposes of carrying out the tasks referred to in Articles 7 and 9; 3. The Authority shall cooperate regularly and closely with national supervisory authorities. It shall ensure cross-sectoral consistency of work and arrive at joint positions in the area of supervision of financial conglomerates and on other cross-sectoral issues. 4. In accordance with the principle of sincere cooperation in accordance with Article 4(3) of the EU Treaty, the parties of the EFSA shall cooperate with trust and full mutual respect, in particular in ensuring that appropriate and reliable information flows between them. (-1) For effective micro- and macro- prudential financial supervision a single European supervisory authority should be established, fully integrating the European Banking Authority (EBA), the European Insurance and Occupational Pensions Authority (EIOPA), the European Securities and Markets Authority (ESMA) and the European Systemic Risk Board (ESRB) into a single entity based on and working closely together with national supervisory authorities. Establishment and Scope of action 1. This Regulation establishes a European Insurance and Occupational Pensions Authority ("the Authority"). 2. The Authority shall act within the scope of Directive 64/225/EEC, Directive 73/239/EEC, Directive 73/240/EEC, Directive 76/580/EEC, Directive 78/473/EEC, Directive 84/641/EEC, Directive 87/344/EEC, Directive 88/357/EEC, Directive 92/49/EEC, Directive 98/78/EC, Directive 2001/17/EC, Directive 2002/83/EC, Directive 2002/92/EC, Directive 2003/41/EC, Directive 2002/87/EC, Directive 2005/68/EC, Directive 2007/44/EC, Directive 2005/60/EC, Directive 2002/65/EC, including all directives, regulations, and decisions based on these acts, and of any further Community act which confers tasks on the Authority. 3. The provisions of this Regulation are without prejudice to the powers of the Commission, in particular under Article 226 of the Treaty to ensure compliance with Community law. 4. The objective of the Authority shall be to contribute to: (i) improving the functioning of the internal market, including in particular a high, effective and consistent level of regulation and supervision, (ii) protecting policyholders and other beneficiaries, (iii) ensuring the integrity, efficiency and orderly functioning of financial markets, (iv) safeguarding the stability of the financial system, and (v) strengthening international supervisory coordination. For this purpose, the Authority shall contribute to ensuring the consistent, efficient and effective application of the Community law referred to in Article 1(2) above, fostering supervisory convergence and providing opinions to the European Parliament, the Council, and the Commission. 5. The Authority shall form part of a European System of Financial Supervisors, hereinafter referred to as 'ESFS', which shall function as a network of supervisors, as further specified in Article 39. 6. The European Insurance and Occupational Pensions Authority shall co-operate with the European Systemic Risk Board, hereinafter referred to as 'ESRB' as laid down in Article 21 of this RegulationThe European Financial Supervisory Authority 1. The European Financial Supervisory Authority (EFSA) shall ensure that the rules applicable to the financial sector are adequately implemented, in order to preserve financial stability and thereby to ensure confidence in the financial system as a whole and sufficient protection for the customers of financial services. 2. The European Financial Supervisory Authority shall comprise the following: (a) the European Systemic Risk Board established by Regulation (EU) No .../... [ESRB]; (b) the European Supervisory Authority (Securities and Markets) established by Regulation (EU) No .../... [ESMA]; (c) the European Supervisory Authority (Insurance and Occupational Pensions) established by Regulation (EU) No …/…[EIOPA]; (d) the European Supervisory Authority (Banking)[EBA]; (e) the Commission, for the purposes of carrying out the tasks referred to in Articles 7 and 9; 3. The Authority shall cooperate regularly and closely with national supervisory authorities. It shall ensure cross-sectoral consistency of work and arrive at joint positions in the area of supervision of financial conglomerates and on other cross-sectoral issues. 4. In accordance with the principle of sincere cooperation in accordance with Article 4(3) of the EU Treaty, the parties of the EFSA shall cooperate with trust and full mutual respect, in particular in ensuring that appropriate and reliable information flows between them. Establishment and Scope of action 1. This Regulation establishes a European Securities and Markets Authority ("the Authority"). 2. The Authority shall act within the scope of Directive 97/9/EC, Directive 98/26/EC, Directive 2001/34/EC, Directive 2002/47/EC, Directive 2002/87/EC, Directive 2003/6/EC, Directive 2003/71/EC, Directive 2004/25/EC, Directive 2004/39/EC, Directive 2004/109/EC, Directive 2005/60/EC, Directive 2009/65/EC, Directive 2002/65/EC, Directive 2006/49/EC (without prejudice to the competence of the European Banking Authority in terms of prudential supervision), Directive … [future AIFM Directive], and Regulation … [future CRA Regulation], including all directives, regulations, and decisions based on these acts, and of any further Community act which confers tasks on the Authority. 3. The provisions of this Regulation are without prejudice to the powers of the Commission, in particular under Article 226 of the Treaty to ensure compliance with Community law. 4. The objective of the Authority shall be to contribute to: (i) improving the functioning of the internal market, including in particular a high, effective and consistent level of regulation and supervision, (ii) protecting protect investors, (iii) ensuring the integrity, efficiency and orderly functioning of financial markets, (iv) safeguarding the stability of the financial system, and (v) strengthening international supervisory coordination. For this purpose, the Authority shall contribute to ensuring the consistent, efficient and effective application of the Community law referred to in Article 1(2) above, fostering supervisory convergence and providing opinions to the European Parliament, the Council, and the Commission. 5. The Authority shall form part of a European System of Financial Supervisors, hereinafter referred to as 'ESFS', which shall function as a network of supervisors, as further specified in Article 39. 6. The European Securities and Markets Authority shall co-operate with the European Systemic Risk Board, hereinafter referred to as 'ESRB' as laid down in Article 21 of this RegulationThe European Financial Supervisory Authority 1. The European Financial Supervisory Authority (EFSA) shall ensure that the rules applicable to the financial sector are adequately implemented, in order to preserve financial stability and thereby to ensure confidence in the financial system as a whole and sufficient protection for the customers of financial services. 2. The European Financial Supervisory Authority shall comprise the following: (a) the European Systemic Risk Board established by Regulation (EU) No .../... [ESRB]; (b) the European Supervisory Authority (Securities and Markets) established by Regulation (EU) No .../... [ESMA]; (c) the European Supervisory Authority (Insurance and Occupational Pensions) established by Regulation (EU) No …/…[EIOPA]; (d) the European Supervisory Authority (Banking)[EBA]; (e) the Commission, for the purposes of carrying out the tasks referred to in Articles 7 and 9. 3. The Authority shall cooperate regularly and closely with national supervisory authorities. It shall ensure cross-sectoral consistency of work and arrive at joint positions in the area of supervision of financial conglomerates and on other cross-sectoral issues. 4. In accordance with the principle of sincere cooperation in accordance with Article 4(3) of the EU Treaty, the parties of the EFSA shall cooperate with trust and full mutual respect, in particular in ensuring that appropriate and reliable information flows between them. (4a) After the first paragraph of Article 31, the following paragraph is inserted: "The European External Action Service shall draw up an estimate of its revenue and expenditure, which it shall send to the Commission before 1 July each year. The High Representative/Vice President of the Commission shall hold consultations with, respectively, the Commissioner for Development Policy and the Commissioner for Neighbourhood Policy regarding their respective responsibility." (4b) In Article 41(1), the following subparagraph is added: "In order to ensure the budgetary transparency in the area of external action of the Union, the Commission shall transmit to the budgetary authority, together with the draft EU budget, a working document presenting, in a comprehensive way, all expenditure related to the external actions of the Union." (4b) In point (3)(a) of Article 46(1), the following subparagraphs are added: "The establishment plan for the EEAS section of the budget shall set the number of posts for each grade in each category and the number of permanent and temporary posts including contractual and local staff authorised within the limits of the budget appropriations. The establishment plan shall show any increase or reduction of posts by grade and category in the EEAS' central administration and the entirety of the Union's Delegations based on the preceding year. The establishment plan shall show, next to the number of posts authorised for the financial year, the number of posts authorised for the preceding year, as well as the number of posts occupied by diplomats coming from the Member States, Council and Commission staff. The Budgetary Authority shall be informed of the number of posts for each grade, in each category and in each of the Union's Delegations as well as the EEAS' central administration. This information shall be presented as an annex to the establishment plan for the EEAS section of the budget." However, detailed rules may be agreed with the Commission in order to facilitate the implementation of the Union Delegations' operating appropriations entered in the EEAS and the Council sections of the BudgetWithin the EEAS a Director General for budget and administration shall be responsible to the High Representative/Vice President of the Commission for the administrative and internal budgetary management of the EEAS. He shall follow the same budget lines and administrative rules as applicable in the Part of Section III of the EU budget which falls under Heading V of the multiannual financial framework. This shall apply mutatis mutandis to the authorities of a Member State for staff coming from the diplomatic services of the Member States. The Member State of origin shall be liable for all sums not recovered within three years after a decision on liability has been taken. (5) It is necessary to establish the minimum number of Member States from which citizensignatories must come. In order to ensure that a citizens' initiative is representative of a Union interestcomes from a significant number of Member States, this number should be set at one third of Member Statesnine. (6) For that purpose, it is also appropriate to establish the minimum number of citizens coming from each of those Member States. In order to ensure similafair conditions for citizens to support a citizens' initiativeof all nationalities, these minimum numbers should be degressively proportional to the size of each Member State. For the purpose of clarity they should be set out for each Member State in an Annex to the present Regulationaccording to the formula as agreed from time to time for the distribution of seats in the European Parliament. (15) It is appropriate to provide that, where a citizens' initiative has received the necessary statements of support from signatories and provided it is considered admissible, each Member State should be responsible for the verification and certification of statements of support collected from citizens coming fromin that State. Taking account of the need to limit the administrative burden for Member States, they should, within a period of three months, carry out such verifications on the basis of appropriate checks, which may be based on random sampling, and should issue a document certifying the number of valid statements of support received. (17) The Commission should examine a citizens' initiative and set out its conclusions and the actions it envisages to take in response to it, within a period of four monthslegal and political conclusions separately; it should also set out the actions it envisages to take in response to it. In order to demonstrate that a citizens' initiative is supported by at least one million signatories and that its possible follow-up is carefully examined, the Commission should explain in a clear, comprehensible and detailed manner the reasons for its intended action, and should likewise give reasons if it does not envisage taking any action. 2. In order to be eligible to support a proposed citizens' initiative, signatories shall be citizens oflegally resident within the Union and shall be of the age to be entitled to vote in the European electionsat least 16 years of age. 3. Proposed citizens' initiatives which can be reasonably regarded as improper because they are abusive or devoid of seriousness will not be registeredThe Commission shall register a proposed initiative within two months from its receipt when the following conditions are fulfilled: (a) the citizens' committee has been formed and the contact persons have been designated; (b) there are no manifest, significant inconsistencies between the different language versions of the title, subject- matter and objectives of the proposed initiative; (c) the initiative manifestly falls within the competences of the Union as conferred on the Union by Member States and falls within the framework of the powers of the Commission to submit any appropriate proposal on matters where citizens consider that a legal act of the Union is required for the purpose of implementing the Treaties; (d) the proposed initiative is not manifestly abusive, frivolous or vexatious; (e) the proposed initiative is not manifestly contrary to the values of the Union as set out in Article 2 of the Treaty on European Union. 1. The signatories of a citizens' initiative shall come from at least one third ofnine Member States. 2. In one third ofnine Member States, the number of signatories shall comprise at least the minimum number of citizens set out in Annex Inform to the formula of degressive proportionality as established in the current distribution of seats in the European Parliament. b. examine the citizens' initiative and, within 4within three months, set out in a communication its legal and political conclusions on the initiative, the action it intends to take, if any, and its reasons for doing or not doing so. ba. present a legislative proposal within one year or include the proposal in its next year's Work Programme. If the Commission does not so act it shall give the organisers as well as the European Parliament a detailed explanation. 2a. The budgetary provisions shall apply mutatis mutandis to the guarantee for borrowing-and-lending operations entered into by the Union in the management of the European Financial Stability Facility (EFSF) and the European Financial Stability Mechanism (EFSM) and payments to the Guarantee Fund for external actions. 3a. The surplus and the unspent commitments of the previous budgetary years of the current multi-annual financial framework as well as decommitted appropriations shall be entered in the reserve for payments and commitments. This reserve shall be used in first instance for any additional and/or unforeseen needs as well as to compensate any negative reserve, which procedure is laid down in article 44. The decision to mobilise this reserve will be taken jointly by the two arms of the budgetary authority following a proposal by the Commission. The draft budget shall contain a summary general statement of the expenditure and revenue of the Union, including a summary general statement of the reserve for payments and commitments, and consolidate the estimates referred to in Article 32. 4a. The Commission shall accompany the draft budget with a proposal to mobilise the reserve for payments and commitments for any arising needs not initially foreseen in the annual budget or the regulation laying down the multiannual financial framework. This reserve must be drawn upon as soon as possible and before the end of the financial year, in first instance by means of the reserve for payments and commitments, as laid down in Article 15 (3a), or by means of transfer in accordance with the procedure laid down in Articles 21 and 23. (1) The purpose of this Decision is to establish the organisation and functioning of the European External Action Service ("EEAS"), a functionally autonomous body of the Union under the authority of the High Representative, set up by Article 27(3) of the Treaty on European Union ("TEU"), as amended by the Treaty of Lisbon. This Decision and in particular the reference to the term "High Representative" will be interpreted in accordance with her different functions under Article 18 of the TEU. (3) The EEAS will support the High Representative, who is also a Vice- President of the Commission and the President of the Foreign Affairs Council, in fulfilling her mandate to conduct the Common Foreign and Security Policy ("CFSP") of the European Union and to ensure the consistency of the EU's external action as outlined, notably, in Articles 18 and 27 TEU. The EEAS will support the High Representative in her capacity as President of the Foreign Affairs Council, without prejudice to the normal tasks of the General Secretariat of the Council. The EEAS will also support the High Representative in her capacity as Vice- President of the Commission, for her responsibilities within the Commission for responsibilities incumbent on it in external relations and for coordinating other aspects of the Union's external action, without prejudice to the normal tasks of the Commission services. (3a) In its contribution to the EU external cooperation programmes, the EEAS should seek to ensure that these programmes respond to the objectives for external action as set out in Article 21 TUE, in particular its paragraph (2)(d) and that they respect the objectives of EU development policy in line with Article 208 TFEU. In this context, the EEAS should also promote the fulfilment of the objectives of the European Consensus on Development and the European Consensus on Humanitarian Aid. (5) The European Parliament will fully play its role in the external action of the Union, including its functions of political control as provided for in Article 14(1) of the TEU, as well as in legislative and budgetary matters as laid down in the Treaties. Furthermore, in accordance with Article 36 of the TEU, the High Representative will regularly consult the European Parliament on the main aspects and the basic choices of the CFSP and will ensure that the views of the European Parliament are duly taken into consideration. The EEAS will assist the High Representative in this regard. Specific arrangements should be made with regard to access for Members of European Parliament to classified documents and information in the area of CFSP. Until the adoption of such arrangements, existing provisions under the 2002 Interinstitutional Agreement on classified documents and information in the area of ESDP will apply. (7) Provisions should be adopted relating to the staff of the EEAS and their recruitment. For matters relating to its staff the EEAS should be treated as an institution within the meaning of the Staff Regulations. I where such provisions are necessary to establish the organisation and functioning of the EEAS. In parallel, necessary amendments should be made, in accordance with Article 27(3)336 of the TFEU, the EEAS will comprise officials from the General Secretariat of the Council and the Commission as well as personnel seconded from the diplomatic services of the Member States. The High Representative will be the Appointing Authority, in relation both to officials subject to the Staff Regulations of Officials of the European Communities ("Staff Regulations") and agents subject to the Conditions of Employment of Other Servants. The High Representative will also have authority over the Seconded National Experts ("SNEs") in post in the EEASo the Staff Regulations of Officials of the European Communities ("Staff Regulations") and the Conditions of Employment of Other Servants of those Communities ("CEOS") without prejudice to Article 298 of the TFEU. For matters relating to its staff the EEAS should be treated as an institution within the meaning of the Staff Regulations. The High Representative will be the Appointing Authority, in relation both to officials subject to the Staff Regulations and agents subject to the Conditions of Employment of Other Servants. The number of officials and servants of the EEAS will be decided each year as part of the budgetary procedure and will be reflected in the establishment plan. (7a) The staff members of the EEAS will carry out their duties and conduct themselves solely with the interest of the Union in mind. (7b) Recruitment will be based on merit whilst ensuring adequate geographical and gender balance. The staff of the EEAS should comprise a meaningful presence of nationals from all the Member States. The review foreseen in 2013 should also cover this issue, including, as appropriate, suggestions for additional specific measures to correct possible imbalances. (7c) In accordance with Article 27(3) of the TEU, the EEAS will comprise officials from the General Secretariat of the Council and the Commission as well as personnel coming from the diplomatic services of the Member States. For that purpose, the relevant departments and functions in the General Secretariat of the Council and in the Commission will be transferred to the EEAS, together with officials and temporary agents occupying a post in such departments or functions. Before the 1st of July 2013, the EEAS will recruit exclusively officials originating from the General Secretariat of the Council and the Commission as well as staff coming from the diplomatic services of the Member States. After that date, all officials and other servants of the European Union should be able to apply for vacant posts in the EEAS. (7d) The EEAS may, in specific cases, have recourse to specialised seconded national experts (SNEs), over which the High Representative will have authority. Seconded National Experts in post in the EEAS will not be counted in the one third which staff from Member States should represent when the EEAS will reach its full capacity. Their transfer in the phase of setting up of the EEAS will not be automatic and will be made with the consent of the authorities of the originating Member States. By the expiry of the contract of an SNE transferred to the EEAS under article 6bis, the function will be converted into a temporary agent post in cases where the function performed by the SNE corresponds to a function normally carried out by staff at AD level, provided that the necessary post is available under the establishment plan. (7e) The Commission and the EEAS will agree on modalities relating to the issue of instructions from the Commission to delegations. These should foresee in particular that when the Commission will issue instructions to delegations, it will simultaneously provide a copy of these to the Head of Delegation and the EEAS central administration. (8) In order to ensure the budgetary autonomy necessary for the smooth operation of the EEAS, the Financial Regulation should be amended in order to treat the EEAS as an "institution" within the meaning of the Financial Regulation, with a specific section in the Union budget. The EEAS will be subject to the procedures regarding the discharge as provided for in Article 319 of the Treaty on the Functioning of the European Union and in Articles 145 to 147 of the Financial RegulationThe Financial Regulation should be amended in order to include the EEAS in Article 1 of the Financial Regulation, with a specific section in the Union budget. In accordance with applicable rules, and as it is the case for other institutions, a part of the annual report of the Court of Auditors will be dedicated also to the EEAS and the EEAS will respond to such reports. The EEAS will be subject to the procedures regarding the discharge as provided for in Article 319 of the Treaty on the Functioning of the European Union and in Articles 145 to 147 of the Financial Regulation. She will provide the European Parliament with all support necessary to complete European Parliament’s right as discharge authority. The implementation of the operational budget will be the Commission’s responsibility in accordance with Article 317 of the TFEU. Decisions having a financial impact will in particular respect the responsibilities laid down in Title IV of the Financial Regulation, especially Article 75 thereof regarding expenditure operations and Articles 64 to 68 regarding liability of the financial actors. (8a) The establishment of the EEAS should be guided by the principle of cost- efficiency aiming towards budget neutrality. To this end, transitional arrangements and gradual build-up of capacity will have to be used. Unnecessary duplication of tasks, functions and resources with other structures should be avoided. All opportunities for rationalisation should be used. In addition, a number of additional posts for Member States' temporary agents will be necessary which have to be financed within the framework of the current multi-annual framework. (12) This Decisione High Representative should, be reviewed in the light of experience iy mid-2013, make a review of the functioning and organisation of the EEAS, accompanied, if necessary, by proposals for a revision of this Decision. Such a revision should be adopted no later than the beginning of 2014. 2. The EEAS shall assist the President of the European Council, the President of the Commission, and the Commission and, in the President of the European Councilexercise of their respective functions in the area of external relations. 1. The EEAS shall support and work in cooperation with the diplomatic services of the Member States as well as with the General Secretariat of the Council and the services of the Commission, as well as with the diplomatic services of the Member States, in order to ensure consistency between the different areas of the Union external action and between these and its other policies. 2. The EEAS and the services of the Commission shall consult each other on all matters relating to the external action of the Union in the exercise of their respective functions except on matters covered by CSDP. The EEAS shall take part in the preparatory work and procedures relating to acts to be prepared by the Commission in this area. This paragraph shall be implemented in accordance with Chapter 1 of Title V of the TEU, and with Article 205 of the Treaty on the Functioning of the European Union ("TFEU"). 4. The EEAS shall extend appropriate support and cooperation to the other institutions and bodies of the Union, in particular to the European Parliament. The EEAS may also benefit from the support and cooperation of these institutions and bodies, including agencies as appropriate. The EEAS internal auditor will cooperate with the internal auditor of the Commission to ensure the consistency of audit policy, with particular reference to the Commission’s responsibility for operational expenditure. In addition, the EEAS shall cooperate with the European Office for the Fight against Fraud (OLAF) in accordance with Regulation (EC) N° 1073/1999. It shall in particular swiftly adopt the decision required by this Regulation on terms and conditions for internal investigations. As provided in this Regulation, Member States, in accordance with national provisions, and institutions shall give the necessary support to enable the OLAF’s agents to fulfil their task. 1. The EEAS shall be managed by an executive Secretary-General who will operate under the authority of the High Representative. The executive Secretary- General shall take all measures necessary to ensure the smooth functioning of the EEAS, including its administrative and budgetary management. He shall ensure effective coordination between all departments in the central administration as well as with the Union delegations, and shall represent the EEAS. 2. The executive Secretary-General shall be assisted by two Deputy Secretaries- General. - the crisis management and planning directorate, the civilian planning and conduct capability, the European Union Military Staff and the European Union Situation Centre, placed under the direct authority and responsibility of the High Representative in her capacity as High Representative for Foreign Affairs and Security Policy; t, shall assist her in the task of conducting the Union’s CFSP in accordance with the provisions of the Treaty while respecting, in accordance with Article 40 of the TEU, the other competences of the Union. The specificities of these structures, as well as the particularities of their functions, recruitment and the status of the staff shall be respected. Full coordination between all the structures of the EEAS shall be ensured. 4. The High Representative shall designate from among EEAS staff members the chairpersons of Council preparatory bodies that are chaired by a representative of the High Representative, including the chair of the Political and Security Committee, in accordance with the modalities set out in Annex II of the COUNCIL DECISION of 1 December 2009 laying down measures for the implementation of the European Council Decision on the exercise of the Presidency of the Council, and on the chairmanship of preparatory bodies of the Council, (2009/908/EU)1. 1 OJ L 322, 9.12.2009, p. 28. 1. The decision to open a delegation shall be adopted by the High Representative, after consulting the Council and the Commission. The decision tor close a delegation shall be adopted by the High Representative, in agreement with the Council and the Commission. 2. Each Union delegation shall be led byplaced under the authority of a Head of Delegation. In areas where the Commission exercises the powers conferred to it by the Treaties, the Commission may, in accordance with article 221(2) TFEU, also issue instructions to delegations, which shall be executed under the overall responsibility of the Head of Delegation. 5. The operation of each delegation shall be periodically evaluated by the Secretary General of the EEAS; evaluation shall include financial and administrative audits. The Secretary General of the EEAS may request to be assisted for this purpose by the relevant Commission departments. In addition to internal measures by the EEAS, OLAF shall exercise its powers, notably by conducting anti-fraud measures, in accordance with Regulation (EC) N° 1073/1999. 7. Union delegations shall have the capacity to service the needs of other EU institutions, in particular the European Council and the European Parliament, in their official contacts with the international organisations or third countries to which they delegations are accredited. 8. The Head of Delegation shall have the power to represent the EU in the country where the delegation is locaaccredited, in particular for the conclusion of contracts and being a party to legal proceedings. 9. The Union delegations shall work in close cooperation and share information with the diplomatic services of the Member States. They shall, on a reciprocal basis, provide all relevant information. 10. The Union delegations shall have the capacity to,, acting in accordance with Art. 35, 3rd subparagraph of the EU Treaty and upon request by Member States, support the Member States in their diplomatic relations and in their role of providing consular protection to Union citizens in third countries. -1. The provisions set out in this Article, except paragraph 2, shall apply without prejudice to the Staff Regulations of Officials of the European Communities ("Staff Regulations") and the Conditions of Employment of Other Servants of those Communities ("CEOS"), including the amendments made to these rules, in accordance with Article 336 of the TFEU, in order to adapt them to the needs of the EEAS. 1a. If necessary, the EEAS may, in specific cases, have recourse to a limited number of specialised seconded national experts (SNEs). The High Representative shall adopt the rules, equivalent to those laid down in Council Decision 2003/479/EC as amended by Council Decision 2007/829/EC of 5 December 20071, under which SNEs are put at the disposal of the EEAS in order to provide specialised expertise. 1 OJ L 327, 13 December 2007, page 10. 2. The staff members of the EEAS shall carry out their duties and conduct themselves solely with the interests of the Union in mind. Without prejudice to Articles 2(1), third subparagraphindent, 2(2) and 5(3), they shall neither seek nor take instructions from any Government, authority, organisation or person outside the EEAS or any body or person other than the High Representative. In accordance with the second paragraph of Article 11 of the Staff Regulations, the EEAS staff may not accept any payments of any kind whatever from any other source outside the EEAS. 6. All appoinRecruitments in the EEAS shall be based on merit and on the broadest possible geographical basiswhilst ensuring adequate geographical and gender balance. The staff of the EEAS shall comprise a meaningful presence of nationals from all the Member States. 7. All members of the staff of the EEAS covered by the Staff Regulations and the Conditions of Employment of Other Servants shall have the same rights and obligations, regardless whether they are oOfficials of the European Union orand temporary agents coming from the diplomatic services of the Member States, shall have the same rights and obligations and be treated equally, in particular as concerns eligibility to assume all positions under equivalent conditions. No distinction shall be made between temporary agents coming from national diplomatic services and officials of the European Union as regards the assignment of duties to perform in all areas of activities and policies implemented by the EEAS. In accordance with the provisions of the Financial Regulation, the Member States shall support the Union in the enforcement of financial liabilities resulting from any liability under Article 66 of the Financial Regulation of EEAS temporary agents coming from national diplomatic services. 9. The High Representative shall establish the selection procedures for EEAS staff, which shall be based on merit and on the broadest possible geographical basis, in conformity with the Staff Regulations and the Conditions of Employment of Other Servants, with due regard for gender balance. undertaken through a transparent procedure based on merit with the objective of securing the services of staff of the highest standard of ability, efficiency and integrity while ensuring adequate geographical balance, a need for a meaningful presence of nationals from all EU Member States in the EEAS and aiming towards gender balance. Representatives of the Member States, the General Secretariat of the Council and the Commission shall be involved in the recruitment procedure for vacant posts in the EEAS1. 1 See draft declaration relating to the appointment procedure at the end. 9a. When the EEAS has reached its full capacity, staff from Member States, as referred to in paragraph 1, first subparagraph, should represent at least one third of all EEAS staff at AD level. Likewise, permanent EU officials should represent at least 60% of all EEAS staff at AD level, including staff coming from the diplomatic services of the Member States, who have become permanent EU officials, in accordance with the provisions of the Staff Regulations. Each year, the High Representative shall present a report to the European Parliament and the Council on the occupation of posts in the EEAS. 9b. The High Representative shall lay down the rules on mobility so as to ensure that the members of the staff of the EEAS are subject to a high degree of mobility. Specific modalities shall apply to the personnel referred to in Article 4 (3), third indent. In principle, all EEAS staff shall periodically serve in Union delegations. The High Representative shall establish rules to that effect. 11. The High Representative shall lay down the rules on mobility so as to ensure that the members of the staff of the EEAS are subject to a sufficient degree of mobility. Specific modalities shall apply to the personnel referred to in Article 4 (3), third hyphen. In principle, all EEAS staff shall periodically serve in Union delegations. The High Representative shall establish rules to that effectSteps shall be taken in order to provide EEAS staff with adequate common training, building in particular on existing national and EU practices and structures. The High Representative shall take appropriate measures to that effect within the year following the entry into force of this Decision. Article 6 a Transitional provisions regarding staff 1. The relevant departments and functions in the General Secretariat of the Council and in the Commission listed in the Annex shall be transferred to the EEAS. Officials and temporary agents occupying a post in departments or functions listed in the Annex shall be transferred to the EEAS. This shall apply mutatis mutandis to contract and local staff assigned to such departments and functions. SNEs working in those departments or functions shall also be transferred to the EEAS with the consent of the authorities of the originating Member State. These transfers shall take effect on 1 January 2011. In accordance with the Staff Regulations, upon their transfer to the EEAS, the High Representative shall assign each official to a post in his function group which corresponds to his grade. 2. The procedures for recruiting staff for posts transferred to the EEAS which are on-going at the date of entry into force of this Decision shall remain valid: they shall be carried on and completed under the authority of the High Representative in accordance with the relevant vacancy notices and the applicable rules of the Staff Regulations and the Conditions of Employment of Other Servants. 1. The High Representative shall act asduties of authorising officer for the EEAS section of the General Budget of the European Union andshall be delegated in accordance with Article 59 of the Financial Regulation. The High Representative shall adopt the internal rules for the management of the correspondingadministrative budget lines. These internal rules shall lay down which of the powers of the authorising officer are delegated to the Secretary- General and the conditions under which the Secretary-General can sub delegate these powersOperational expenditure shall remain within the Commission section of the budget. 3. As regards operational expenditure arising from the implementation of the CFSP budget, the Instrument for Stability, the Instrument for CooperWhen drawing up estimates of administrative expenditure for the EEAS, the High Representative will hold consultations with Industrialised Countries, the Communication and Public Diplomacy as well as the Election Observation Missions, the Commission shall be responsible for their financial management under the authority of the High Representative in her capacity as Vice-President of the Commission, respectively, the Commissioner for Development Policy and the Commissioner for Neighbourhood Policy regarding their respective responsibility. 3a. In accordance with Article 314(1) of the TFEU, the EEAS shall draw up estimates of its expenditure for the following financial year. The Commission shall consolidate these estimates in a draft budget, which may contain different estimates. The Commission may amend the draft budget as provided for in Article 314(2) of the TFEU. 3b. In order to ensure the budgetary transparency in the area of external action of the Union, the Commission will transmit to the budgetary authority, together with the Draft EU Budget, a working document presenting, in a comprehensive way, all expenditure related to the external action of the Union. 4. The EEAS shall be subject to the procedures regarding the discharge provided for in Article 319 of the Treaty on the Functioning of the European Union and in Article 145 to 147 of the Financial Regulation. The EEAS will, in this context, fully cooperate with institutions involved in the discharge procedure and provide, as appropriate, the additional necessary information, including through attendance in meetings of the relevant bodies. 1. In the framework of tThe management of EU external cooperation programmes, which remain is under the responsibility of the Commission, the High Representative and the EEAS shall contribute to the programming and management cycle for the following geographic and thematic instruments, on the basis of the policy objectives set out in the said instruments: - the Development Cooperation Instrument, - the European Development Fund, - the European Instrument for Democracy and Human Rights, - the European Neighbourhood and Partnership Instrument, - the Instrument for Cooperation with Industrialised Countries, - the Instrument for Nuclear Safety Cooperation without prejudice to role of the Commission and of the EEAS in programming as set out in the following paragraphs. 2. In accordance with Article 3, throughout the whole cycle of programming, planning and implementation of thesThe High Representative shall ensure overall political coordination of the EU's external action, ensuring the unity, consistency and effectiveness of the EU’s external action in particular through the external assistance instruments,: - the High Representative and the EEAS shall work with the relevant members and services of the Commission. All proposals for decision will be prepared through Commission procedures and submitted to the Commission for decisionDevelopment Cooperation Instrument, - the European Development Fund, - the European Instrument for Democracy and Human Rights, - the European Neighbourhood and Partnership Instrument, - the Instrument for Cooperation with Industrialised Countries, - the Instrument for Nuclear Safety Cooperation, - the Instrument for Stability, regarding the assistance foreseen in article 4 of Regulation (EC) n. 1717/2006 of 15 November 2006. 3. The EEAS shall in particularIn particular, the EEAS shall contribute to the programming and management cycle for the said instruments, on the basis of the policy objectives set out therein. It shall have responsibility for preparing the following Commission decisions onregarding the strategic, multi- annual steps within the programming cycle: (i) country allocations to determine the global financial envelope for each region (subject to the indicative breakdown of the financial perspectives). Within each region, a proportion of funding will be reserved for regional programmes; (ii) country and regional strategic papers (CSPs/RSPs); (iii) national and regional indicative programmes (NIPs/RIPs). In accordance with Article 3, throughout the whole cycle of programming, planning and implementation of these instruments, the High Representative and the EEAS shall work with the relevant members and services of the Commission without prejudice to Article 1(3). All proposals for decision will be prepared through Commission procedures and submitted to the Commission for decision. 4. With regard to the European Development Fund and the Development Cooperation Instrument, any proposals, including those for changes in the basic regulations and the programming documents in paragraph 3 above, shall be prepared jointly by the relevant services in the EEAS and in the Commission under the direct supervision and guidanceresponsibility of the Commissioner responsible for Development Policy and then jointly submitted with the High Representative for decision by the Commission. Thematic programmes, except the European Instrument for Democracy and Human Rights, as well as the Instrument for Nuclear Safety Cooperation and the part of the Instrument for Stability referred to in the seventh indent of paragraph 2, shall be prepared by the appropriate Commission Service under the guidance of the Commissioner responsible for Development and presented to the College in agreement with the High Representative and other relevant Commissioners. 5. With regard to European Neighbourhood and Partnership Instrument, any proposals, including those for changes in the basic regulations and the programming documents in paragraph 3 above, shall be prepared jointly by the relevant services in the EEAS and in the Commission under the direct supervision and guidanceresponsibility of the Commissioner responsible for Neighbourhood Policy and then jointly submitted with the High Representative for decision by the Commission. 5a. Actions undertaken under the CFSP budget, the Instrument for Stability except the part referred to in the seventh indent of paragraph 2, the Instrument for Cooperation with Industrialised Countries, the Communication and Public Diplomacy as well as the Election Observation Missions are under the responsibility of the High Representative/EEAS. The Commission shall be responsible for their financial implementation under the authority of the High Representative in her capacity as Vice-President of the Commission1. The Commission department responsible for this implementation shall be co-located with the EEAS. 1 The Commission will make a declaration to the effect that the High Representative will have the necessary authority in this area, in full respect of the Financial Regulation. 1. The High Representative shall, after consulting the Committee referred to in Council Decision 2001/264/EC, decide on the security rules for the EEAS and take all appropriate measures in order to ensure that the EEAS manages effectively the risks to its staff, physical assets and information, and that it fulfils its duty of care responsibilities. Such rules shall apply to all EEAS staff, and all staff in Union Delegations, regardless of their administrative status or origin. 1a. Pending the Decision referred to in paragraph 1: - with regard to the protection of classified information, the EEAS shall apply Council Decision 2001/264/EC; - with regard to other aspects of security, the EEAS shall apply Commission Decision 2001/844/EC. 1. The General Secretariat of the Council and the relevant Commission services shall take all necessary measures so that the transfers referred to in Article 6(8)a can be accompanied by the transfers of the Council and Commission buildings necessary for the functioning of the EEAS. 2. The High Representative shall submit a report to the European Parliament and to the Council on the functioning of the EEAS in 2012no later than the end of 2011. This report shall in particular cover the implementation of the provisions of Article 8 and Article 5(3) and (10). 3. The Council, acting on a proposal fromBy mid-2013, the High Representative, shall review this Decision in the light of experience no later than the beginning of 2014, in accordance with Article 27 of the TEUmake a review of the functioning and organisation of the EEAS, which will cover inter alia the implementation of the provisions of Article 6(7) and (10). This review, shall, if necessary, be accompanied by appropriate proposals for revision of this Decision. In this case, the Council, in accordance with Article 27(3) TEU shall, revise this Decision in the light of the review no later than the beginning of 2014. 4. This Decision shall enter into force on the date of its adoption. Its provisions on financial management and recruitment going beyond the existing Staff Regulations and Financial Regulation shall only produce their legalshall take effects once the necessary amendments to the Staff Regulations and the Financial Regulation, as well as the amending budget, have been adopted. In order to ensure a smooth management of the personnel of the EEAS and pending the entry into force of the modifications to the Staff Regulations, the Conditions of Employment of Other Servants and the Financial Regulation necessary for the implementation of this Decision, aArrangements shall be entered into by the High Representative, the General Secretariat of the Council and the Commission, and consultations shall be undertaken with the Member States to ensure a smooth transition. 1. Recalls that the European Parliament intends to exercise to the full its responsibilities as regards both the formulation and control of the Common Foreign and Security Policy, which were recognised by the High Representative in her declaration on political accountability1; 1 Declaration annexed to the European Parliament position of 8 July 2010 on the proposal for a Council decision establishing the organisation and functioning of the European External Action Service (texts adopted (P7_TA(2010)0280)). 2. Approves this amending budget and recalls the provisions of Article 4 of Council Decision 2010/427/EU of 26 July 2010 establishing the organisation and functioning of the European External Action Service1 and the commitments given by the High Representative in her statement made at the plenary sitting of the European Parliament on 7 July 2010 concerning the basic organisation of the central administration of the European External Action Service (EEAS); 1 OJ L 201, 3.8.2010, p. 30. - having regard to the joint statement by the Council and the representatives of the governments of the Member States meeting within the Council, the European Parliament and the Commission on European Union Development Policy: ‘The European Consensus’1, signed on 20 December 2005, __________________ 1 OJ C 46, 24.2.2006, p. 1. Financiële belangen: 1. 2. 5/7 NL 3. Finanzielle Interessen: 1. 2. 5/7 DE 3. CV/0 deleted Doctor of Law (1975). CV/1 deleted National chairman, Young VLD (1979-1981); national chairman, PVV (1982-1985); national chairman, PVV (1989-1992); national chairman, VLD (1992-1995); Minister of State (since 1995). National chairman, PVV (1997-1999); interim national chairman, Open VLD (since 2009). CV/2 deleted Member of Ghent City Council (1976-1982). Member of Ghent City Council (2007-2009). CV/3 deleted Member of the House of Representatives (1978-1995); Member of the Senate (1995-1999). CV/4 deleted Deputy Prime Minister and Minister for the Budget, Scientific Research and the Plan (1985-1988). Prime Minister (1999-2008). CV/5 deleted President of the EU Council (second half-year)(2001). CV/6 deleted Vice-Chair of the Supervisory Boaard of APG-Nederland (2009). CV/7 deleted Grand Cordon of the Order of Leopold. National chairman, Young VLD (1979-1981); national chairman, PVV (1982-1985); national chairman, PVV (1989-1992); national chairman, VLD (1992-1995); Minister of State (since 1995). National chairman, PVV (1997-1999); interim national chairman, Open VLD (since 2009). Member of Ghent City Council (1976-1982). Member of Ghent City Council (2007-2009). Member of the House of Representatives (1978-1995); Member of the Senate (1995-1999). Deputy Prime Minister and Minister for the Budget, Scientific Research and the Plan (1985-1988). Prime Minister (1999-2008). 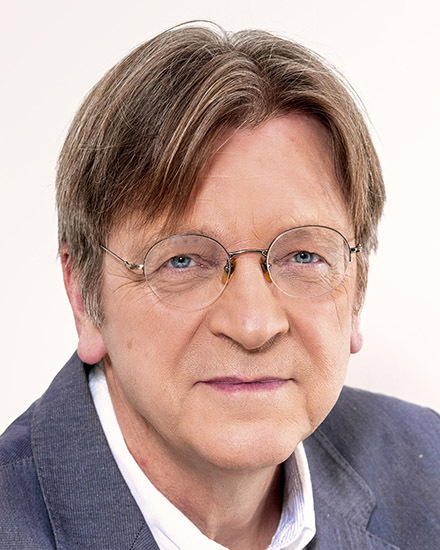 President of the EU Council (second half-year)(2001). Vice-Chair of the Supervisory Boaard of APG-Nederland (2009). Grand Cordon of the Order of Leopold.